The newest made-for-TV kitchen gadget is here. The "Perfect Bacon Bowl" creates an edible shell out of strips of bacon. WASHINGTON – You’ve heard of bacon festivals. Maybe you’ve tried bacon deodorant. There’s the bacon doughnut sandwich. And a bacon sundae. Ford wrapped a car in bacon. So why not a bacon bowl? 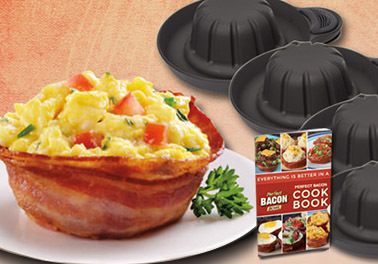 According to MarketWatch, Allstar Products Group launched the “Perfect Bacon Bowl” through infomercials late last year. Since then, the comany has sold more than two million of the $10.99 bacon cookers. The kitchen gadget turns strips of bacon into an edible shell, perfect for macaroni and cheese, pastrami or a salad, according to MarketWatch. According to the makers, the gadget can also be used to make bread bowls and more.